Makar Sankranti is celebrated on Saturday 14th January in 2017. Makar Sankranthi occurs in Pusya Month according to the Hindu Calendar. Makar Sankranti is one of the few Hindu festivals which is celebrated on a fixed date it varies between three days 14, 15 and 16 of January every year. Makar Sankranti is four days festival period which is dedicated to Lord Sun. In India, Makar Sankranti is a Major harvest Festival. All across North and West India, flying kites and feasting on rice and sweets made from sesame seeds is an integral part of the festivities. 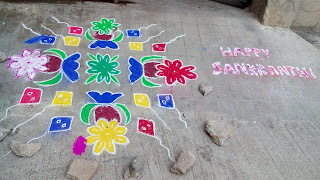 Sankranti is the festival of rangoli. There are two types of rangoli one is dots rangoli and the other one is lines rangoli. As the rangoli is the symbol of goddess Lakshmi. So, people believe that goddess will visit the homes are welcoming with rangoli. As the twelve zodiac signs The rotation of God Sun from Sagittarius zodiac to Capricorn zodiac is the beginning of Sankranti festival. The Sun stands for knowledge, spiritual light and wisdom. Sun is considered to be the king of all the planets. Uttarayan Punyakalam is starts from Makar Sankranti. Uttarayan Punyakalam is most important period and many festivals will be celebrated in this period. On the occasion of Sankranti people woke up early and finish their regular activities and specially on Sankranti rangoli will be drawn at front of the doar or gate. They will buy a new pot and clean and cover with white cement (Sunnam), vermilon (Kumkum), Turmeric (Pasupu) and a thread with a leaf is wearied, then pour milk into the pot. The Rangoli design is drawn on the mud or Floor in front of the door. The Rangoli is decorated with various colors. In the middle of rangoli dried cow dung (pidakalu) were placed above this the pot is kepted. After that all around the pot Navadanyalu were placed that includes Gingelly (Nuvvulu), Black Gram (Minumulu), Green Gram (Pesarlu), Bengal Gram (Sanagalu), Corn (Makkalu), Jowar, Rice, Ragi and Alisanthulu. opposite to the pot place a broom stick is cleaned and a new saree is placed, above this goddess statue is placed. The God Statue is cleaned and a white cloth Composed of turmeric is weared, and a chain wearing on the Neck. besides the God a Mirror, Sugarcane, Regipallu, Gedipallu were placed. Then coconut will be broken in front of the God and the dried cow dung is lightned. After milk boiled in the pot pour some rice into pot and keeps until the milk flows out. And the sweet is shared with everyone. 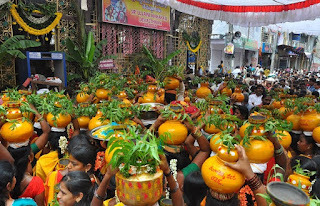 In Tamil Nadu Sankranti is known as Pongal. In Gujarat and Rajasthan Makar Sankranti is known as Uttarayana. In Haryana and Punjab Makar Sankranti is known as Maghi. The significance of Uttarayana Punyakalam is at the Mahabharata times when Bhishma did astrasanyas waited till this day to depart so Arjuna built the bed with the arrows. Popular belief is that one who dies on this day gains moksha and it means no rebirth. The Uttarayana Punyakalam is the period of six months gods woke up and Dakshinayan Punyakalam the period of six months gods sleep. Bhageratha brought river Ganga to earth on this day Sankranti by penance. Makar is a Sanskrit word which literally means Capricorn where as Sankranti denotes transition. Makar Sankranti marks the end of winter, when the sun moves into the northern hemisphere. Sun transit from Dakshinayana to Uttarayana. Sankranthi is the beginning of Uttarayana Punyakalam Sankranthi is the season at this time harvest will be completed and all grains will come to home. Makar Sankranti is a biggest harvest festival. The festivities include sweets made of Rice, jaggery, green gram and sesame. Sankranti it is a festival of kites. In Gujarath there is a museum for kites.